Anti-CD20 therapy and B cells in autoimmunity. 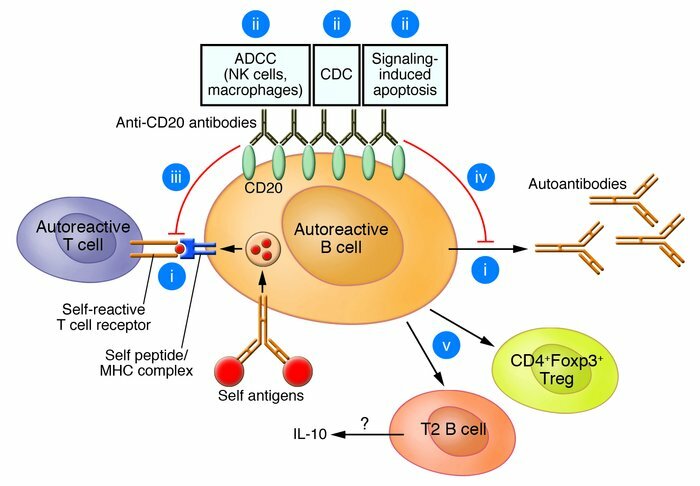 Autoreactive B cells play a role in autoimmune diseases via their production of circulating autoantibodies and/or their role as antigen-presenting cells for autoreactive T cells after the capture of self antigens by cell surface autoantibodies that increase their antigen-presentation capabilities (i). Rituximab and other anti-CD20 mAbs cross-link CD20 on the surface of B cells and induce B cell depletion mainly through ADCC, although complement-dependent cytotoxicity (CDC) and apoptosis have also been implicated (ii). Anti-CD20–mediated B cell depletion prevents interaction with autoreactive T cells (iii) and reduces the amount of circulating autoantibodies (iv), although with much slower kinetics. Finally, as suggested by Hu et al. in their study in this issue of the JCI (1), anti-CD20 therapy may induce Treg and regulatory B cell populations (CD4+Foxp3+ Tregs and transition type 2 [T2] B cells) that could play a role in restoring immune tolerance, possibly via the production of IL-10 (v).